Anti-static steel cement panel’s surface is phosphoretted, antirust and treated with epoxy powder coating. The inner cavity is filled with light weight foamed cement. With the bottom sheet stretched entirely and the four edges riveted, The panel is made on the advanced assemble line, and is characterized as surface smooth, bearing strength high, electric conduction excellent, shockproof and corrosionproof with a life span 3-5 times longer than ordinary panels. The products are used widely in all kinds of computer rooms, electrical control rooms, post and telecommunication centres and many other comprehensive control rooms. 1. According to loading capacity, we have light, medium, heavy type panels, bearing 800LB, 1000LB, 1250LB respectively. 2. According to dimension, we have 600MM and 610MM panels, and could cut standard round or square wiring outlet. 3. 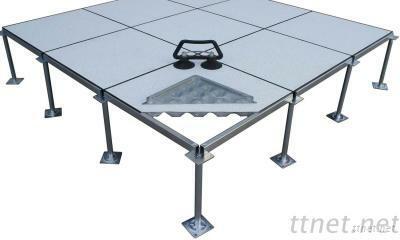 The surface is covered with anti-static HPL or conductive PVC, marble, ceramic tile.